GOP education summit: Six candidates meet with Campbell Brown in New Hampshire. 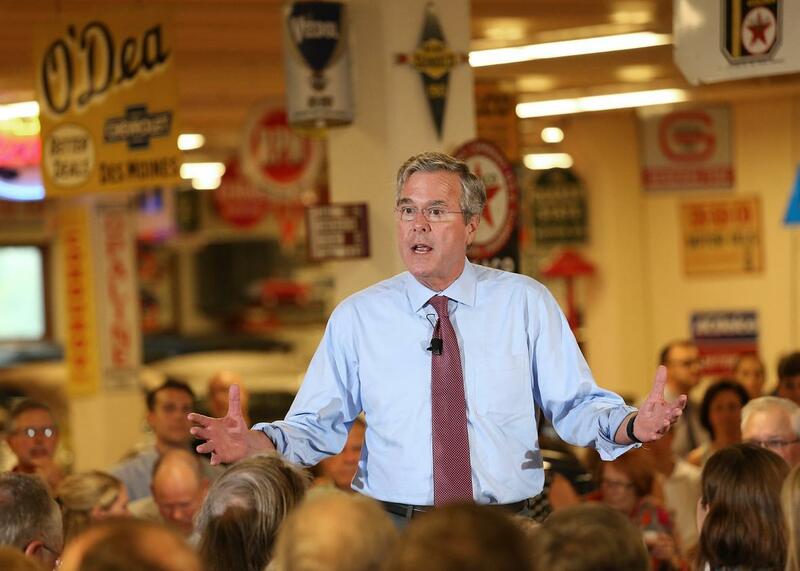 Jeb Bush was the first GOP hopeful to sit down and talk K-12 education with Campbell Brown. On Wednesday six GOP candidates for president—Jeb Bush, Carly Fiorina, John Kasich, Scott Walker, Bobby Jindal, and Chris Christie—sat on a stage in a Londonderry, New Hampshire, high school to talk K–12 education policy with former CNN anchor-turned-“education activist” Campbell Brown. The New Hampshire Education Summit, sponsored by the school choice advocacy organization the American Federation for Children and hosted by Brown’s glossy new school-reform website, the Seventy Four (both, it is safe to say, are sympathetic to right-leaning education proposals currently in vogue), gave the six GOP candidates who showed up 45-plus minutes each to expound their views on K–12 education. The result was a daylong school-choice lovefest. Here’s what the candidates covered (hint: race, class, and poverty seldom made the cut). Bush also loves the “nerdy concept” of Title I portability that lets free- and reduced-meals students take their Title I dollars to the school of their choice. When asked about his pick for secretary of education, Bush gestured at his interviewer—a good indication of the tenor of hard-hitting conversation that Brown would be leading throughout the day. Bush also doubled down on his support for keeping the federal testing schedule in place and endorsed more federal money going to pay for privately run pre-K programs. Every time Ohio Gov. John Kasich—tieless and strenuously California business casual on Wednesday—takes the stage, I think, “Wow, if the Republicans weren’t too insane right now to notice, this guy could really be president.” Kasich doesn’t let anyone forget that he’s in charge of a crucial swing state, where, he claims, he’s gotten “85 to 90 percent of everything we wanted” in education, like vouchers galore and improvements in troubled systems in Cleveland and Youngstown. One weird note in an otherwise respectful conversation occurred when Kasich said, “If I were not president, but if I were King of America, I would abolish all teacher’s lounges, where they sit together and worry about ‘woe is us.’ ” After that out-of-nowhere stab (earlier in his speech, Kasich had acknowledged successfully collaborating with teachers’ unions in rebuilding Cleveland’s schools), Kasich ended by echoing a nod to God he’d made earlier in the forum: “I believe the Lord watches what we do with our children. And the more we dedicate ourselves to having those children rise, and to use their great brains to help heal this world and bring justice, the happier He is.” Er … OK? What struck me most about the often stiff, stony Walker was his self-assurance and liveliness when talking about these issues—but then they’re at the core of his worldview, after all. He displayed actual animation on numerous subjects, including the role of technology in kids’ lives. “My son Matthew can tie a bow tie much better than I can because he learned it on YouTube,” he said with a laugh. Louisiana Gov. Bobby Jindal was another unexpectedly energetic speaker on the subject of K–12 education in his state. He began by talking about next week’s 10th anniversary of Hurricane Katrina and how it revolutionized the education system of New Orleans. “It is hard to overstate how bad our public school system was,” Jindal said. “And it was expensive.” But now New Orleans, the only “100% choice” city in the country, is the shining beacon of why education reform works: Pre-Katrina, Jindal said, 60 percent of kids were in failing schools; now it’s only 10 percent. Though he was a bit shakier when it came to policy details for the rest of Louisiana, Jindal didn’t back down from his repudiation of Common Core: “I like the concept of what I thought Common Core was going to be” was the most he’d allow of his past support. He then told his favorite story about how his son’s experience applying, or failing to apply, a labyrinthine method to simple arithmetic. Here, for once, Brown pushed back, saying that her son’s Common Core-aligned Singapore math homework “fascinated” her. But nope, Jindal wasn’t buying it. Unlike the “elites” who want to mandate how many Big Gulps New Yorkers consume in a day, he pretty wants much the federal government out of the classroom. Writing massive checks to states is fine, but otherwise, the feds should get out and stay out. But then, in a departure, the pugnacious governor described how he—unlike President George W. Bush—worked with Randi Weingarten, the president of the American Federation of Teachers, on spending (or squandering, depending on your perspective) Mark Zuckerberg’s $100 million donation to the Newark schools. “I didn’t like [working with Weingarten], but I did it,” he said. But even more so than when he was condemning teachers unions, Christie became most jazzed when describing his technological pipe dreams for education. Instead of weighing themselves down with all those hefty textbooks, every child in America should get an iPad! And banish blackboards—Smart Boards only FTW! Exactly how many Mark Zuckerbergs would it take to bankroll that one? *Correction, Aug. 20, 2015: This post originally misstated that the first GOP primary debate took place last week. It was two weeks ago.